You are here: Home » MEDIA » Books » Time’s Convert (book 4) by Deborah Harkness (book review). 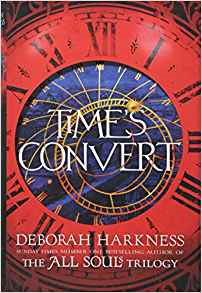 Time’s Convert (book 4) by Deborah Harkness (book review). With the recent series of ‘A Discovery Of Witches’ on UK TVs and, soon to be seen across the world, now is as good a time as any to get into the story of Diana Bishop, the witch and Matthew Clermont, the vampire. Please don’t start with ‘Time’s Convert’ as it is the fourth book in the series, so only read on if you are up to speed with the original trilogy. This sequel to the trilogy uses already established characters and fills in some of the story of those who supported Diana and Matthew in their quest for understanding. The Congregation has backed off and Diana has established hearth and home with the long lived Matthew de Clermont. Phoebe, the girl-friend of Marcus, who is the sired son of Matthew, prepares to take on becoming a vampire. We follow her story and delve into Marcus and his troubled past. Sired and virtually abandoned by Matthew. the story of Marcus follows the colourful times of revolution in the newly minted States of America and in the bloody revolt against the aristocracy in France. The main drive of the narrative is the vampirification of Phoebe and Marcus’ story with interesting titbits of the life of Diana and her children. This feels a fairly safe sequel which doesn’t really add any meat to the story about the Congregation. We are left hanging on the potential future shenanigans of the Congregation member the vampire Gerbert and others. I’m left also thinking that this may be deliberate now that there are going to be at least three TV series. We need to keep these characters moving around the chessboard but nothing and no one will be sacrificed just yet. Having said all my qualifications, it did not hinder my enjoyment of the continuing story but I miss the dilemmas of the previous three books where I felt there was more drama and a more dynamic storyline. What I like about the book is the historical elements and how it manages to bring the narrative beautifully full circle. The historical events are woven through where man’s inhumanity against man and the enduring humanity of the vampire clash and contrast. It’s a clever use of history and the long-lived vampire taking that oh so long view. « Voyager 2 goes interstellar.